Marek Szwarc, Painter and sculptor. Born in Zgierz (Poland) on May 9, 1892 – died in Paris, December 28, 1958. From 1910 to 1914 he lived and studied art at the Ecole des Beaux Arts in Paris. During the early years he boarded at La Ruche together with Fernand Léger, Amedeo Modigliani, Chaim Soutine, Marc Chagall, and Pinkas Krémegne, among others, and founded in 1912 with Joseph Tchaikov and Yitzhak Lichtenstein the first Jewish art journal Makhmadim (Precious Ones). In 1913 he exhibited his first sculpture, "Eve," in the Salon d'Automne. During the First World War Szwarc returned to Poland. In 1919 he met and married Guina, a Polish writer, and together they returned to Paris after the war. 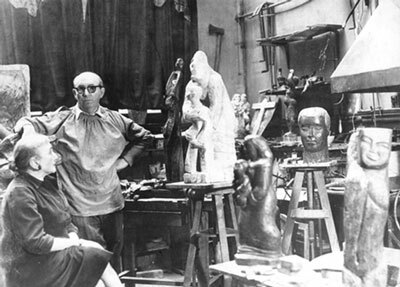 Until World War II, Szwarc lived in Paris and his paintings and sculptures were bought by collectors in Germany, Poland, the United States, and by several museums. It was during this period between the wars that he produced some of his most outstanding and original work in hammered copper, exhibited in the Salon des Tuileries and the subject of a monograph by Louis Vauxcelles. Szwarc's work, broadly identified in style with the Ecole de Paris, was frequently but no exclusively concerned with biblical themes from the Old and New Testament. The latter motifs coming into play after his conversion to Catholicism in 1919. His identity as a Jew, however, never wavered, as is evidenced in his article, "The National Element in Jewish Art," published in a Yiddish literary journal in Warsaw in 1925. During this time, moreover, Szwarc remained an active member Yung-Yiddish—an important circle of Jewish painters, writers, and poets who met regularly in Lodz and Warsaw—and a number of Szwarc’s linocuts appeared in the Yiddish expressionist journal Albatross, edited by Uri Zvi Greenberg. He exhibited in Sweden, Austria, France, Canada, Belgium, Poland, and several sculptures were bought by the French government. Szwarc joined the Polish army in exile in Scotland during World War II, while his wife and daughter fled via Lisbon to England. After the war he returned with his family to Paris. His daughter, Tereska Torres, published a memoir in English, The Converts, which deals in large part with her parent’s conversion. After the war Marek Szwarc devoted most of his time to sculpting in stone and wood and casting in bronze. The artist's works are on display in museums, public halls, places of worship, and private collections in France, Poland, Israel, Canada, Venezuela, the United States, and England.